We've all heard the phrase "It takes a village.." and Zach and I couldn't be more grateful to have each one of you in our village for love and support during this exciting time. 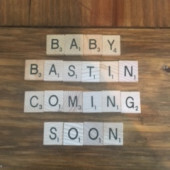 Although we won't find out if Baby Bastin is a he/she until his/her birthday we know that our child is the luckiest to have you in their life. Thank you from the bottom of our hearts!